Are you beginning a new project today? Finishing a project? What are you working on? Hi Mary, I only recently found your blog and I'm in love with your work! I'm working on getting my sewing mojo back after a long pregnancy and lack of time for it with two little ones. Today I'm hoping for a little time to chop up my new Loulouthi flannels! Can't sleep so thought I'd see what my blogging friend were up to! Lovely hand quilting and pretty binding!!! yawn.... I'll never get up!!! I enjoy seeing your quilts and your hand quilting especially. As I have never hand quilted before, would you say that hand quilting stands up to use/washings as well as machine stitching? Will it last the test of time (or 3 kids)? Beautiful work. Your stitches are so perfect!! Ive been sewing colourful hexagons, and last night I pulled out some corduroy to get started on something for corduroy day on the 11/11. Not quite sure yet but I'm giving myself a week to finish a top. i am trying to finish up my pouch for the pretty little pouch swap. but honestly, my work this morning has been cleaning... the vacuum is finally working again! yahooo! you would be amazed to know how good it feels to walk on freshly vacuumed floors! Gorgeous! No new project here as yet...did some embroidery on a felt Christmas decoration though which was fun! Your stitches are looking luscious, I love the way they sit on the quilt and beg to be admired. Still nibbling on some red and green between child care duties here. Dish quilt. I love that hand quilting. I just finished today the Sampler from Bari J. on her We Love French Knots blog. Love the triangles and the stitching is perfect! Thank you for the beautiful photos for the day. Your stitches are so lovely on that quilt. enjoy the relaxation that comes from hand quilting. Look forward to seeing more. I finished putting binding on a picnic quilt and just pulled it from the dryer : ). I don't use a hoop, do you always use one? I guess I should! Very pretty! Love the red stitching. Looks good! I'm still working on my Pillow Fight cushion! Did you notice anything sneaky on my garden post?? I am trying to finish two swaps - a pillow (cushion to me) and a tablerunner - or I should be if I ever get going! Still slightly footsore after hols in Rome where I was working on spool blocks and circles to cover the holes in my polo fruity quilt! Your stitching is fab - red being the Mary favourite??? Love your quilting! I'm just between projects and have cleaned my machine ready to get going on the next project on my list! I love the lark quilt. Love the red. I am working on some perle cotton hand quilting and some Cathedral Window blocks. 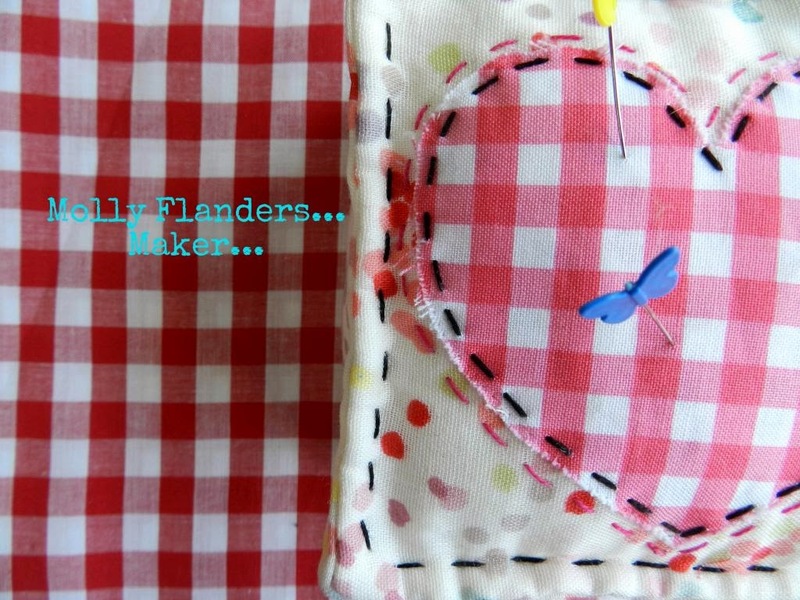 I love your hand quilting projects they are so beautiful, they've inspired me to try my hand at it too! What kind of quilting hoop do you use? Hi Olivia! I couldn't find your email so hopefully you will find my answer here. I have a very old hoop. It is an 18" round hoop. The only one I have found that is similar to this one is The Edmunds Hoop. You can order the Edmunds from Jo-Anns online. They do not have them in the store. The only hoops Jo-Ann has in the store is a cheap hoop which really doesn't hold a quilt nice and tight.